Marcia here today with a spring card to share that showcases the New Powderpuff Chalk Inks, the New Quote Bundles, and new Dusty Road papers. I just love these new ink colors and the Quote Bundles are just perfect for cards, layouts, or even canvas wall decor. The stamp I chose to use is an old one that I picked up at a garage sale, but it is perfect for Spring. I colored the stamped and embossed image with my Powderpuff inks using my H2O pen. Embossing the image keeps the inks from running together. I just love being able to color with white! I am so ready for Spring! How about you? Are you making any spring crafts? 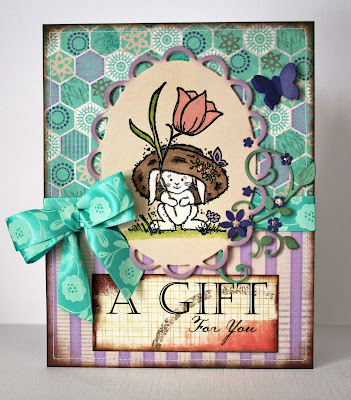 Love this...your stamping and coloring is perfect! Marcia... how cute is this!?! I love that you used the PowderPuff Chalking Inks to color the image! Brilliant! What a fabulous idea to use the chalk inks to color. Awesome project Marcia!